What are Assessment Centre Role-Play Exercises? This is one of the most popular exercises you will come across in your assessment centre. This is because it enables your prospective organisation to see how well you behave with others and is applicable to almost every employee, from a supervisor to senior management. This type of exercise also allows the assessors to actually test how you respond when put on the spot or dealing with conflict. The key purpose of the exercise is to again see what competencies you display and how your behaviour matches those of the required role. So your ability to perform well in this exercise will have a direct correlation with how familiar you are with the role’s required competencies and behaviours. As part of your preparation you need to discern from the advertisement, job specification and your knowledge of the organisation the key competencies the role requires. With this knowledge you can then ascertain which behaviours you will be required to show and which ones are most likely to be part of the role-play exercise. Disciplining or appraising a member of staff. Discussing an aspect of your company merger. Many assessment centres in the interest of efficiency and cost now conduct these exercises over the phone and record the interactions to be assessed later on. This sort of detail is often not known until you are about to take part in this exercise. It is important to be aware that your role-play exercise has to be homogenous in nature so that each candidate faces a similar number of challenges and experiences. In some instances organisation will use a specifically trained individual or consultant to conduct the role-play, whilst others prefer to use well briefed actors. If the role-play requires a detailed knowledge of the organisation’s policies and procedures it is often better for someone with in-house knowledge to perform this role, as an actor may have to resort to such answers as ‘I’ll get back to you on that’. You must keep at the forefront of your mind that this role-play is about you exhibiting the required behaviours and not necessarily providing the ‘best answer’. As part of your own preparation you should ensure that you have both face-to-face and over the phone interactions with a colleague or your mentor. This will ensure that you are not temporarily disconcerted by the style your role-play exercise takes allowing you to display the desired behaviours. For the majority of role-play’s you will have about 10minutes in which to read the briefing information and then between 20-30 minutes in the actual exchange. This limited time doesn’t usually offer you the opportunity to explore issues in depth so keeping control of the dialogue and reaching your required conclusion or outcome should focus your line of communication and questioning. Your ability and speed with which you come to the main issue will be a direct reflection of your planning and analytical abilities to the assessors. The most popular behaviours assessor’s are looking for in this exercise are listed below. You must review this list in the context of the actual role and organisation you are applying for so that you can add or amend this list accordingly. Many of these behaviours are best illustrated through your preparation and evaluation of the situation presented to you to handle. The last three behaviours in this list will be more applicable to certain situations and may not always be appropriate in your scenario. 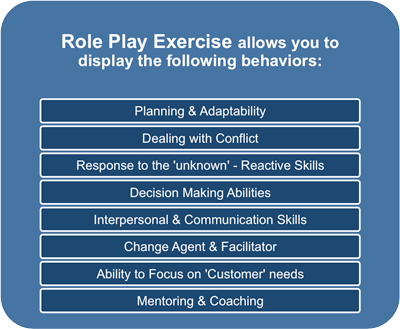 Role-play exercises are described in depth in the 'Assessment Centre' eBook. The Media Interview exercise is unlikely to be in the majority of assessment centres, but if you are seeking a senior management position or directorship then you must familiarise yourself with this exercise. You can view it as a unique role-play exercise designed to assess how well you perform with the press. If you are likely -- as part of your role -- to be involved with talking to journalists or have to field-press enquiries, then you must be aware of how to tackle this sort of exercise. You must also ensure that you display the appropriate competencies and behaviours your role requires. Interaction with the press and acting as a spokesperson for your organisation is most likely to be stated in your job specification, but be aware of subtle inferences that you may perform in this activity. The more senior your position within an organisation, the more likely you will have some dealings with the press. For example, you may be seeking a role as ‘Finance Director’ and think this doesn’t apply to you, but consider who the press may call to ask about the latest annual report or performance reports. You could find yourself the organisation’s spokesperson, even if the occasion is rare. You can quickly see that all of these scenarios have a negative aspect which the majority of journalists will exploit. This exercise is designed to test how you respond to a ‘crisis’ and unexpected situation. Also to see how well you portray the Organisation under pressure from a journalist to get a ‘good’ story a possible front page headline! To perform well in this exercise your preparation is vital. You must research the organisation’s ethos thoroughly to give you a clear understanding of its mission and how to communicate this to others. This will include you giving careful consideration to exactly what words you would use to express this ethos. The more familiar you can become with your organisation's ethos and values the more easily you will be able to communicate as if you were already part of the organisation. You will be able to glean much of this information from the following types of sources. As you go through the press releases and any resulting coverage you will be able to see how the press interpreted and portrayed your organisation. If you wanted to get a more detailed picture of their public relations you could call their Public Relations (PR) agency and ask to speak to their account manager who may be willing to provide you with a fuller picture. They may even be kind enough to provide you with a 'Notes to Editors', which lists key achievements, strategic objectives, target press and journalists they focus on in their PR activities. In addition to these preparations focused on the organisation and its activities, you should also source a host of supporting industry facts and figures. You would then be able to appreciate any key issues that your journalist may focus on during this exercise from both the organisation’s and industry’s perspective. The media interview exercise is covered in depth in the 'Assessment Centre' eBook.